I realize you may not see differences in today and yesterday……BUT, it IS there. I even did some scraping. For one thing, I’d been working on the second panel more so today I looked and the first panel (which was my favorite) was looking a little rough in comparison to the second one. Now…..do I want to refine the first one more or add more to the second one??? Maybe do both….so I added some more orange and yellow to the second one, camouflaged the edges of the left side of the second one. Edges are SO important in this as in all painting….sharpen some, soften some. So much to my shoulder’s distress, I kept moving them from wax station to painting wall. I scraped some but I like a certain amount of raw look and texture and not all smooth refined surface. Smooth can be beautiful…on someone else’s painting..not necessarily on MINE. 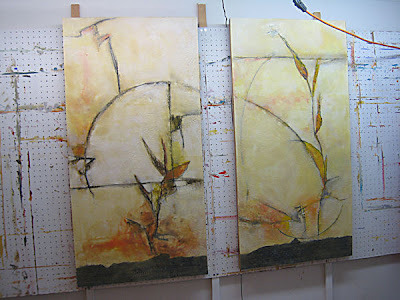 Looking at them together..if I really want this to be a conjoined two panel painting I might add some more linear work and wax to the right one to connect more to the left side. As a separated diptych or just two panels in the same group, I could just leave it alone. If I ‘connect’ them, I might want to add more neutral white in the right one as it has so much less and is more than a little yellow in the background areas compared to the left. Decisions, decisions….all is decision and looking at the relationships.